If you know your six day stats then you'll be aware that the Australian pairing of Danny Clark and Don Allan is the ninth most successful ever, based on wins, with 15; but fifth most successful ever based on points from top four finishes - 15 wins, 15 second places, 11 third places and 12 fourth places. While Allan's legend is firmly centered on the boards, he was also a gifted and versatile road rider before his work on the indoor tracks took precedence. 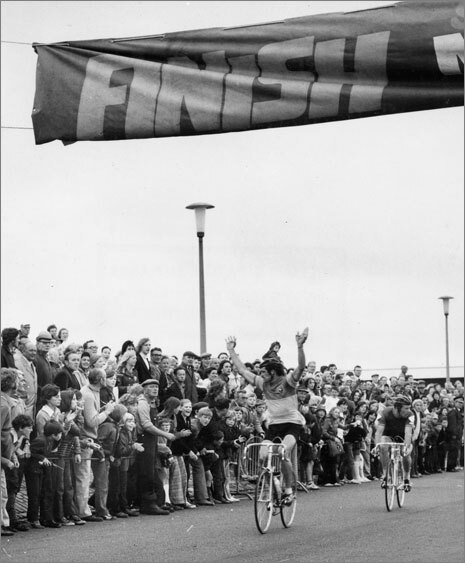 His first big international win was a stunning stage win in the 1973 Peace Race, followed by a stage win in the Tour of Austria the same year; the following year he turned pro for Dutch team Frisol - he would stay there for four years. 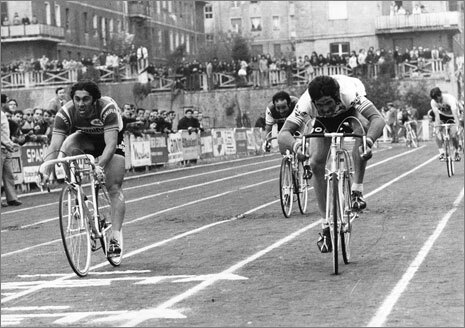 In '75 he rode the Tour again, won again in the criteriums, rode an excellent Worlds but most notably won a stage in the Vuelta - beating none other than 'Mr.10,000 volts,' former world pro road race champion, Marino Basso of Italy. PEZ: You won a stage in the Peace Race, Don - that ain't easy! Don Allan: Stages in the Peace Race certainly weren't easy to win. There was enormous strength within the Eastern European countries; especially in '73 we had Likhachev (Russia) and Szurkowski (Poland) to battle with. Likhachev won siz stages and was impossible to beat in a normal sprint to the line. He was strong and ruthless (Polish iron man Stanislaw Szozda once described Likhachev as a 'gangster.' Ed.) so I thought my best chance was to enter the stadium first and try and hold him off. PEZ: Was the Peace Race as grim as we've heard? DA: The Peace race was hard and difficult because of the quality of the riders and as you can imagine, hugely important to the Eastern Bloc countries. Allan celebrates a stage win at the Peace Race. PEZ: How did the contract with Frisol come about? 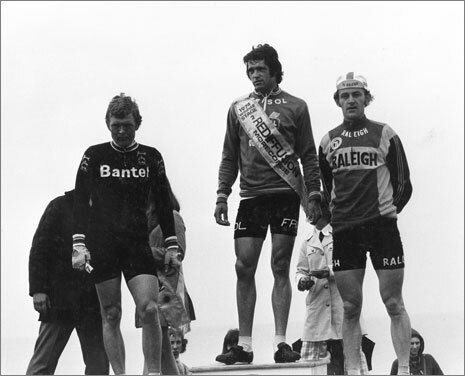 DA: I rode well in the season of '73 and people in Holland were impressed with my style of racing. In one particular amateur criterium in Holland I was winning many primes and looked certain to win the race. The others in the break - I think three or four them - ganged up on me and kept sending one rider away and letting me chase. I got second but one of the riders was so impressed that when my name was mooted as a possibility for Frisol he assured the boss I would be good. Originally thought I was going to be in an amateur Frisol team but the Frisol boss wanted a pro team with Fedor den Hertog as number one rider and so I became a pro. Piet Libregts, the team manager came and met me at the house I was staying at in Amsterdam and was impressed with me. We are still friends today and I have regular contact with him. PEZ: Wasn't it a huge cultural hurdle - an Aussie on a conservative Dutch team and what about the language barrier ? DA: I didn't find it a cultural hurdle....I loved the challenge. I had seven Dutch lessons and taught myself by translating small articles from the newspaper. Once I was with the other riders I caught on quick. There were times when I found it difficult but I persevered. I must say I was also well accepted by the Dutch riders and that helped; they called me 'Kangaroe' but I felt as though I was one of them. I was invited back to the Frisol reunion in 2007 and even had to give a speech. PEZ: You rode for a wide variety of teams during your career. DA: I did ride for some small sponsors but pretty well just for clothing etc. six day racing wasn't terribly important for major sponsors. PEZ: Tell us about beating Basso to take your Vuelta stage; I can guess he wouldn't have been best pleased? DA: The Frisol team owner Nico de Vries said he had heard I was a cinder track expert, I said I wasn't an expert but had beaten Likhachev and Szurkowski on a cinder track in the Peace Race. He said he knew about that and as the stage tomorrow finished on a cinder track I was to be the man and the other riders were to look after me. 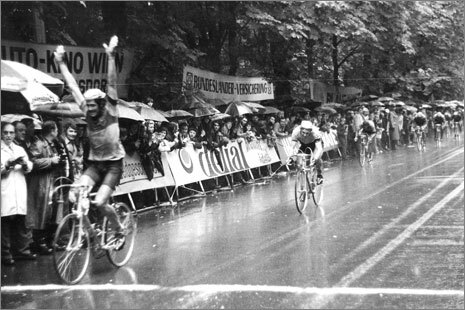 We were down to only four men, myself, Hennie Kuiper, Jose de Cauwer, Willy Vanneste; not far from the finish was a climb - along with many others, I got dropped. The Frisol boys dropped back and worked like crazy to rejoin the peloton and proceeded to take me to the front. I could see many teams smiling at these three riders bringing me to the front. Hennie said "What do you want us to do, Don" I replied to just make sure I was at the front nearing the stadium so I could be first onto the track. My best chance was to put some distance into Basso and hope he couldn't catch me. I just hung on and no, I don't think he was too happy being beaten in a sprint finish. Allan beating Basso to take his Vuelta stage win. PEZ: You were top ten in '76 Worlds at Ostuni. DA: Ninth place in a Worlds looks good on paper especially when you see who was ahead of me; but the course wasn't difficult and there was a large group coming up to the finish with four riders away. Merckx had been given a 12 sprocket for the race to try out, he was one of the first riders I think to have that size of cog and he led the group out from a long way out, perhaps a kilometer or more. The order we were behind him - in Indian file - when he went was how we finished; it was like sitting behind a locomotive on full steam. PEZ: I believe you turned down an offer to ride for Raleigh? DA: After my ride in the world's in Ostuni Peter Post came up to me and said he wanted me to ride for Raleigh. I asked him would that mean riding less sixes and he said "yes." PEZ: When you look back, which rides give you most satisfaction? DA: I was happy with all my wins. The Peace Race stage definitely the best. I won the last stage of the Tour of Austria the day after Graeme Jose, our team mate, died so I like to think I won it for him. To win a criterium or kermis is also a great thrill because you are beating the Dutch and Belgians at their own game. 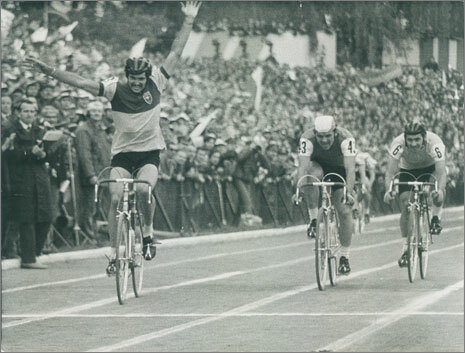 My best ride ever was the World Title in Yvoir in'75. Hennie Kuiper my team mate won and I finished 22nd; only 28 finished. It was a gruelling race and I was gone one lap to go but struggled back on to a group. The last time over the climb to the finish I couldn't stay with them and gradually drifted off the back. They were also 'gone' but I was worse. Jan Jansen drove along side me up the climb talking very quietly to me and giving me encouragement and kept saying what a great ride I had done. He was so close to me our elbows were almost touching. There were perhaps 10 or 12 cars following and all stayed behind Jan Jansen. Just before the top of the climb he gradually went ahead, each car as they passed came close to me and the occupants gave me encouragement in French, Dutch, Italian, whatever. By the time I reached the top of the climb the last car was level with me and Jan Jansen was just behind the group. It was like I was still in the group and managed to find something and just got on to Freddy Maertens' wheel. I finished with them - Jan Jansen had timed it to perfection. The riders in that group were some of the best of that era, such as Gimondi, Maertens, Verbeek, Poulidor, and Dierickx. I was very proud to finish with such great riders on such a tough course. PEZ: How would you describe yourself as a roadman? DA: I liked to establish a break in a race or let a break go and then get up to them. As a domestique, I took the job seriously and got a lot of pleasure helping others. I was very strong at the finish and could maintain a tempo for the sprinter where other teams had three riders doing what I did. PEZ: Would you like to be an Aussie pro now, with GreenEdge? DA: Different times now and I don't think Green Edge would have worked in my day. In those days Australians were jealous of each other and would have been difficult to have a team of just Australians. I would have loved more help and support from home though. DA: I was in a car accident when I was young and fractured my pelvis and sacrum. I was paralysed and told I would have difficulty walking again and probably wouldn't ride again. So I am very content with what I achieved on the road. PEZ: And what about the moustache, Don? Don Allan: The moustache was groundbreaking stuff. I felt that it was part of who I was, my image so to speak. My soigneur in the sixes, Jose Vidal did warn me to be careful though. He said if I went badly, it would stand out more because of the moustache and they would laugh at me. I don't think I got laughed at, though.